Instagram can be an endless font of inspirations and introductions, from new fashion concepts to undiscovered travel destinations. For architect Robby Johnston of The Raleigh Architecture Company, the visual app turned out to be a great way to find a new neighbor. Crazy isn’t always the operative word a homeowner uses when looking for a new neighbor, or the quality an architect seeks out when hunting for a new client. But then again, Johnston wasn’t a typical architect looking to sell a standard home. Along with partner Craig Kerins, Johnston was in the midst of developing a matching pair of modernist homes in Raleigh’s Hungry Neck neighborhood…READ MORE. Transforming a historic auto showroom in downtown Asheville. 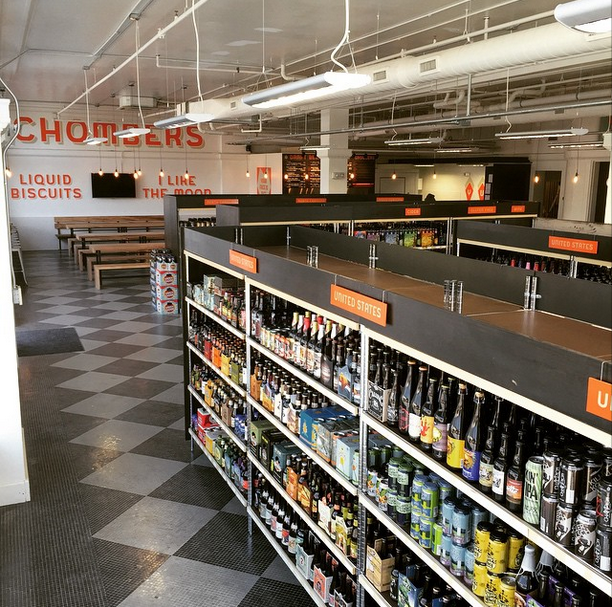 (Raleigh, NC) — The Raleigh Architecture Company (RACo) recently completed the design of the Tasty Beverage bottle shop and tasting room in Asheville, NC, following on the success of the first Tasty Beverage that opened in Raleigh in 2011. For his new shop in Western North Carolina, Johnny Belflower chose 4883 square feet on the first floor of the 1928 Conabeer Chrysler Building on Coxe Street, a three-story steel-frame building faced in orange brick and limestone. The first floor was the original auto showroom. The building was listed on the National Register of Historic Structures in 1979. Keenly aware of the building’s historic significance, RACo partners Craig Kerins, AIA, and Robby Johnston, AIA, were careful to preserve key elements of the building’s interior shell – including copper-clad windows, plaster moldings, tiled floors – as they shaped it into Tasty Beverage. “Simple, minimal detailing lets the old character of the building stay primary,” Kerins said of the open, spacious interior that features a small bar with 10 taps in one corner, plenty of additional seating at tables and benches, and an abundance of retail shelving. Ashville’s Tasty Beverage joins several breweries within walking distance in the city’s South Slope district, an area of the city that’s come to be known as the Beer District. For more information, visit http://avl.tastybeverageco.com. The Raleigh Architecture Co. has been involved with the design of several beer-centric establishments, including Crank Arm Brewing, State of Beer, and Trophy Brewing, all in Raleigh. 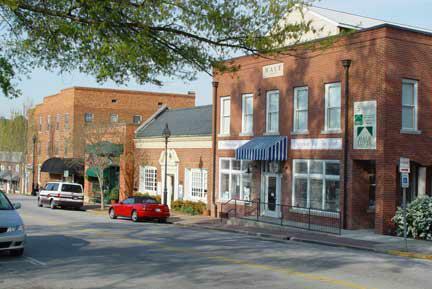 For more information on RACo, visit http://www.raleigh-architecture.com. CLICK HERE to view the segment that aired Wednesday, October 14. 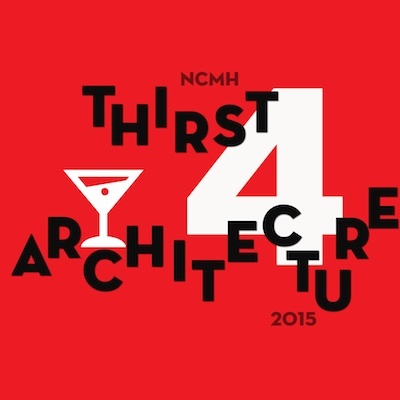 Thursday, Oct. 15, 6-8 p.m.
Craig Kerins, AIA, and Robby Johnston, AIA, principals of The Raleigh Architecture Co., will host October’s Thirst4Architecture (T4A) happy hour along with North Carolina Modernist Houses (NCMH) on Thursday, October 15, from 6-8 p.m.
Free and open to the public, the event will be held at the firm’s offices in the Warehouse District at 502 South West Street, near the corner of West and Cabarrus streets. Food, beverages, and entertainment will be provided. Emilie Huin, broker/owner of Triangle Modern Homes Real Estate LLC, a specialist in Modernist real estate throughout the Triangle, is the 2015 T4A series sponsor. According to NCMH Executive Director George Smart, “T4A offers architects, artists, building managers, contractors, engineers, furniture dealers, realtors, and anyone else interested in Modernist residential design” the opportunity to connect and create strategic alliances in a casual fun environment.” As the host business, The Raleigh Architecture Co. will provide refreshments. NCMH will provide door prizes. Johnston and Kerins founded The Raleigh Architecture Company in 2012. Since then, the young firm has completed 15 Modern residential projects and 15 commercial projects, including retail up-fits within existing historic buildings from Raleigh to Asheville. Their very first projects, two side-by-side houses on Edenton Street, recently won an Honor Award from the North Carolina Chapter of the American Institute of Architects. Their work has also been “People’s Choice” favorites in NCMH’s annual Matusumoto Prize for Modernist residential design. For more information visit www.raleigh-architecture.com. For more information on NCMH and the Thirst4Architecture events, visit www.ncmodernist.org and click on “T4A Happy Hrs” under Events. Three new, modern, for-sale houses in east-central Raleigh. Three new, modern, for-sale houses on Wynne Street in downtown Raleigh, designed by The Raleigh Architecture Co. (RACo), will be part of the “Modapalooza Tour” on Saturday, October 10, sponsored by North Carolina Modernist Houses, an award-winning non-profit organization dedicated to documenting, preserving, and promoting modernist residential design from the 1950s to today. The annual “Modapalooza Tour” takes participants by bus to a selection of new and mid-century modernist houses around the Triangle area. The 10 houses on this year’s tour, however, are all “new,” dating from 2012 to 2015. 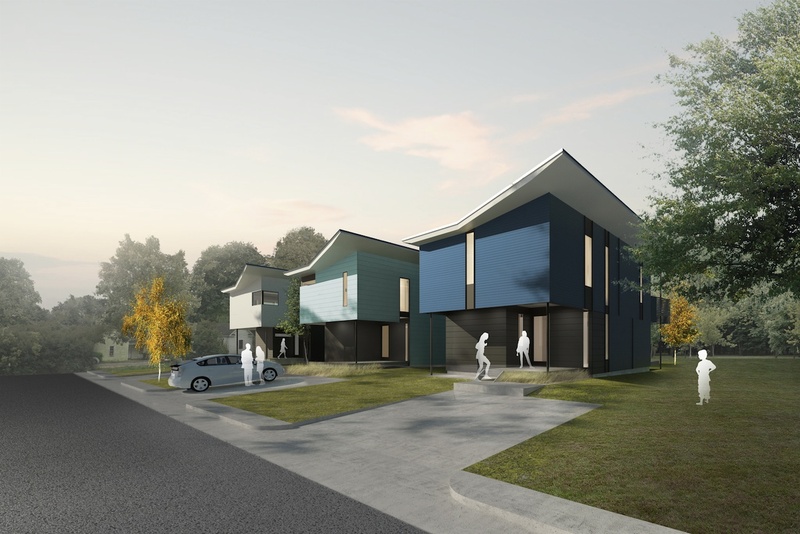 RACo partners Robby Johnston, AIA, and Craig Kerins, AIA, are working in collaboration with Monarch Properties to design and develop the Wynne Street houses, which are nearing completion, in an established inner-city neighborhood in east-central Raleigh. Rising side-by-side on previously empty lots, the houses are two-story, 1805-square-foot structures with open living/dining/kitchen spaces, three bedrooms, and two-and-a-half baths. They feature open, double-height space on the first floors filled with natural light from an abundance of energy-efficient windows and skylights. The kitchens will have simple, modern European-style cabinetry systems. Covered front porches on each house face out towards the neighborhood, while sliding glass doors and covered second-floor balconies provide private access to the backyard. Each of the houses also features a host of structurally sound, energy-efficient elements to ensure their durability against decades of use and North Carolina-specific weather conditions. One of the RACo partners will be on site for the sold-out tour to discuss the design concept and to answer questions. For more information on the houses, visit the development’s website www.liveonwynne.com. For more information on The Raleigh Architecture Co., visit www.raleigh-architecture.com. 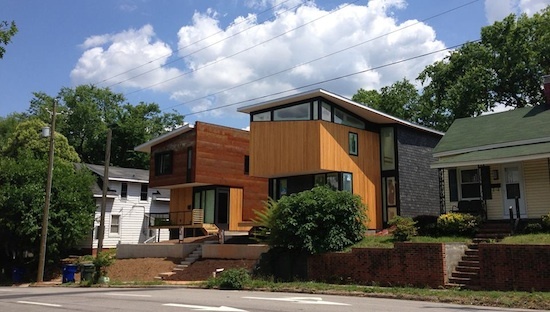 Two modern, urban-infill houses designed in tandem, side-by-side. When architects enter custom-designed housing in awards competitions, they enter either single-family houses or multi-dwelling projects: multiple, separate housing units that are contained within one building or several buildings within one complex. For the 2015 AIA NC Design Awards, The Raleigh Architecture Company (RACo) did neither. 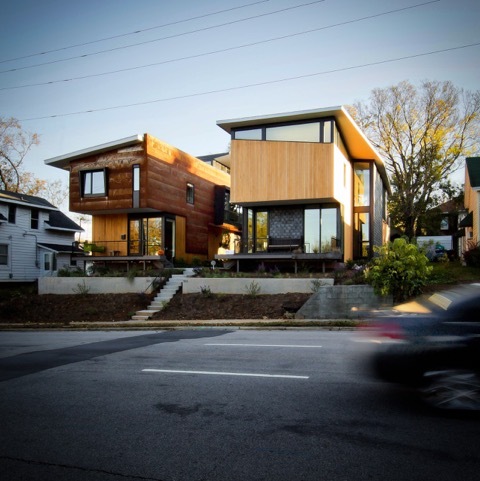 Partners Craig Kerins, AIA, and Robby Johnston, AIA, entered “Edentwins” — two single-family urban-infill houses that they designed concurrently and built on adjoining lots in downtown Raleigh. On September 26, Johnston and Kerins received an Honor Award for their innovative duo from the North Carolina Chapter of the American Institute of Architects (AIA NC) during an awards ceremony held at the 21c Museum Hotel in Durham. “Edentwins challenge standard single-family infill development by sharing space, resources, and mutual values with each other,” said Johnston, who lives in one of the award-winning houses with his wife and young daughters. Edentwins are perched above East Edenton Street, a three-lane, one-way thoroughfare that connects residential neighborhoods to the east with downtown Raleigh. The site plan is organized around a shared central courtyard that visually and spatially ties the houses — and the families who occupy them — together. The courtyard provides outdoor play space for the kids and fresh-air entertainment space for the parents. According to the RACo partners, small buildable areas on the lots and tight zoning restrictions influenced the houses’ compact linear footprints and projecting forms. Front porches, shaded by the cantilevered second floors, link the homes to the community, reinforce the existing vernacular, and maintain how houses there address the sidewalk and street. Conceived of as “fraternal twins,” according to the partners, the homes share common traits yet retain their own identities. 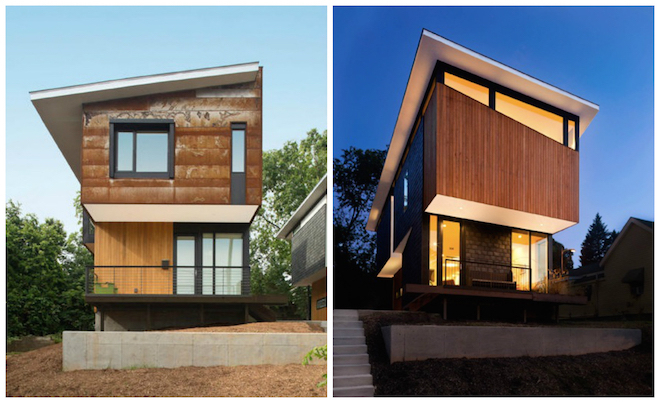 For example, golden-toned North Carolina cypress adds a note of warmth to the exteriors of both flat-roofed houses, although 556 combines the wood with the rusty patina of Corten® steel while 554 uses reclaimed slate from an old house razed in a nearby neighborhood as outdoor cladding. The award-winning “Edentwins” are the first houses in a cluster of homes the RACo team is completing in the old inner-city neighborhood known as Hungry Neck North. For more information on RACo and all of the firm’s projects, visit www.raleigh-architecture.com. You are currently viewing the archives for October, 2015 at THE RACo JOURNAL.